We were awakened in the middle of the night by a strong wind, and noticed that there were no stars overhead. Soon the sky lit up with lightning and thunder cracked in the distance. We decided to put the rain-fly on the tent just in case, and not long after we slipped back into our sleeping bags we heard the pitter-patter of large raindrops. It was a fast-moving storm, and it didn't even rain long enough to fully wet the fly (let alone the dry dusty ground). The wind kept up all night, and when our alarm went off we got up to the coldest morning we've had so far on-trail. The cold, howling wind slowed our morning preparations but as it started to get light we discovered that our little sandy saddle had a clear view of Mt. Shasta's east face. Wearing several layers and gloves, we did hit the trail before 7am knowing that we had a very long day to hike. Our elevation profile for Day 61 was relatively gentle, but we planned nearly 35 miles to position ourselves to cover the entire ~30-mile waterless stretch of the Hat Creek Rim in a single day tomorrow. We started with a rolling ridge-top walk with generally good views of Mt. Shasta and across a deep valley. There were several exposed sandy slopes with deep ravines visible in the distance and although we couldn't see the one we crossed last night in the dark, assumed that it must have looked very much like these. We were surrounded by tall golden grasses and low mixed forest, perfect for picking up the warm tones of the early sunlight. Fortunately within a few hours of sunrise the wind died down and with clear skies it warmed up quickly. 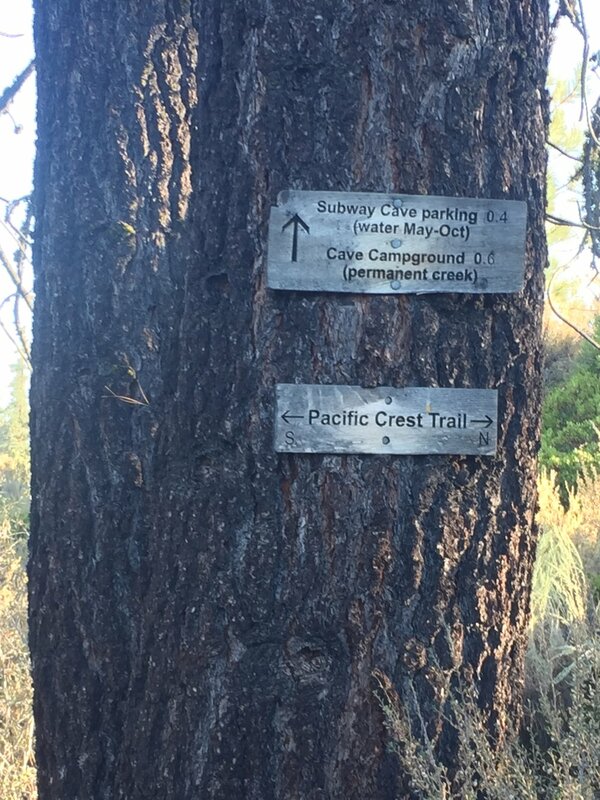 Trail signs have been listing Burney Falls as a destination since this side of Grizzly Peak, which has really brought home for me the distances that we have covered. I grew up in northeastern CA near Mt. Lassen and frequently visited Burney Falls State Park as a child. It was about a 1.5 hour drive from our home, and to think we will have walked there from Canada by this afternoon is a bit mind-boggling. On top of that, we will walk from Burney Falls to very near my parents' home and it will only take us another day and a half to get there. One thing I remember about our trips to Burney Falls is that we always got soft-serve ice cream from the small store on-site, and I have been telling Macro for days that we will eat ice cream cones when we get there. He reminds me that it has been well over a decade since I was last there, they may not have ice cream at all, and first we have to arrive before the store closes. I'd been hoping that we might have time for a dip in the pool below the falls, but given the length of our hiking day I think I'll have to settle for a soft-serve cone. The miles rolled by once the day warmed up and once again northern CA came through with more scenic terrain than expected. On the ridgetop we walked through late summer grasses and wildflowers gone to seed, then entered a forest of predominantly Sugar pine and White fir mixed with low maples, patches of bracken fern, and even long stretches of green grass where the forest was thin enough to let in the sunlight. All of the undergrowth was in berry, the maple leaves were starting to turn color, and many plants had already browned for fall. Wherever the trail was exposed, last night's rain had erased all of the footprints and ours were the first to be laid down. 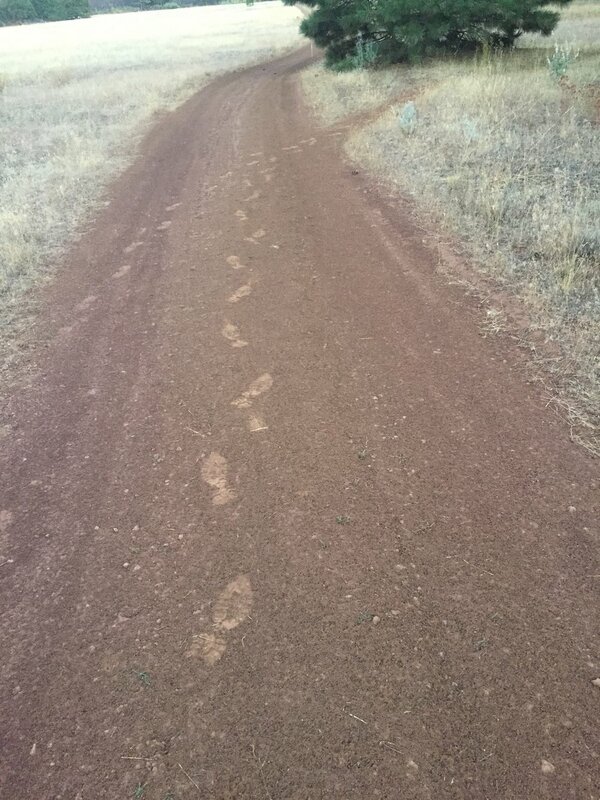 After we ran into a few NOBO section hikers and a handful of weekend backpackers, the trail was once again full of footprints. By early afternoon we were in a third ecosystem, open slopes of Douglas fir with evidence of old logging operations, exposed rock formations, and patches of manzanita. We had distant views of Mt. Shasta in this section and noted both that it was receding and that smoke was starting to gather once more around its base. As we continued to drop in elevation, the temperature rose and the terrain changed again. We walked on dry, cracked earth through an oak and manzanita forest, keeping our eyes peeled for poison oak (though we didn't see any). The sun was blazing hot with little to provide shade, and when we heard the rush of water approaching Rock Creek it sounded incongruous with our surroundings. It would be the first on-trail water since Moosehead Creek the day before. 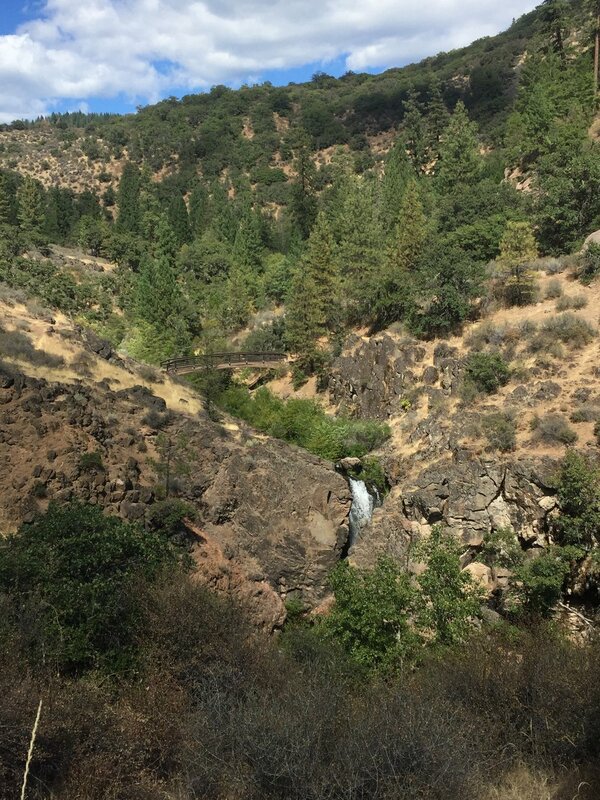 However, we turned a corner in the trail to see the deep rocky canyon containing the water and found the source of the noise - a series of small waterfalls whose green water cascaded into pool after pool over the dark volcanic rock. As most of the water was contained within the rocky channel, there was little greenery nearby and the dry yellow grass extended right to the banks of the creek. We crossed on a bridge high above the water level, and climbed away from this gorgeous little creek across more hot and dry low-elevation terrain. 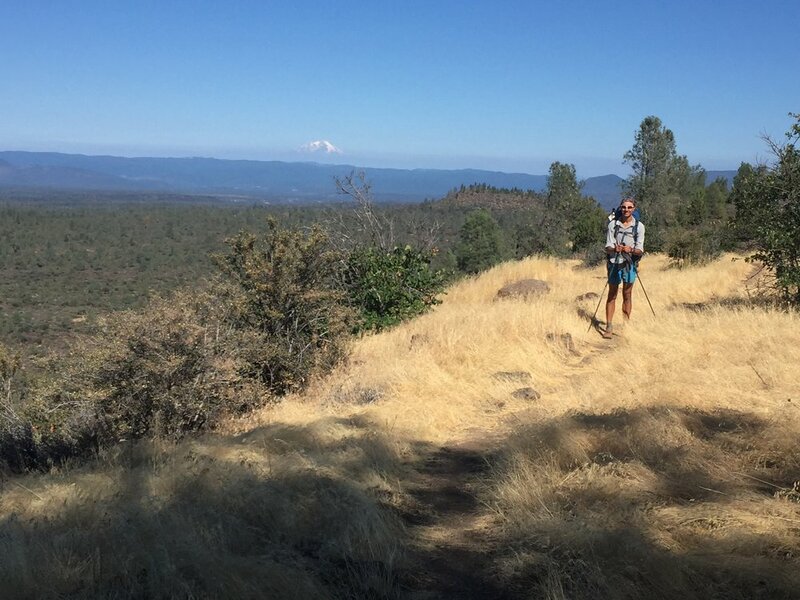 There were a few more patches of conifer forest as we rolled and gradually descended towards Lake Britton, whose dam we walked across, then we were in a dry forest of Incense cedar and Ponderosa Pine for the final approach to Macarthur-Burney Falls State Park. What do you mean they didn't put this patio outside the visitors center just for cooking dinner on? Nearing the side trail to the falls, we saw throngs of people, reminding us that it was still the Labor Day weekend. We reached the park around 4:30pm and it took us a while to get oriented as we walked past the parking lots, interpretive paths, & picnic areas. I discovered that the old store had been converted to a visitors center several years ago, but a larger and new store did sell soft serve ice cream! We enjoyed our cones at the upper overlook of the majestic falls, then made our way to a covered patio outside the visitors center (closed) that conveniently had picnic tables, outlets for charging devices, free WiFi, and a water spigot nearby. This was the perfect setup for a few thru-hikers that need to cook dinner and get water but still have 10 miles to hike for the day. We had the spot to ourselves despite the hundreds of visitors passing by on their way to the more popular parts of the park. The cool evening made for perfect hiking and we made good time over the easy terrain between Burney Falls and Baum Lake. We set up our tent around 10pm and crawled into our sleeping bags, ready for an early start to the fabled Hat Creek Rim tomorrow. Day 62 was another chilly morning and we walked along the lake at dawn with gloves and several layers on. We filled up on water near the fish hatchery, then headed out into the 30-mile dry stretch that includes the Hat Creek Rim. 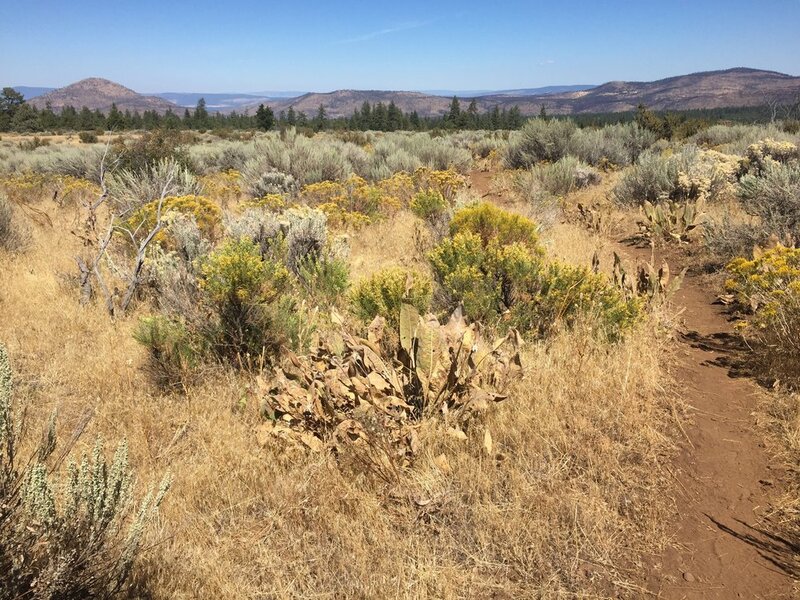 PCT hikers always talk about this section of trail as dry, hot, barren, and endless. As we walked through golden fields with patchy tall trees in the early morning sunlight Macro and I discussed that we didn't really know what to expect from the Rim itself, but that the approach certainly was gorgeous. We picked up early views of Mt. Lassen and could also see Burney Mountain nearby. 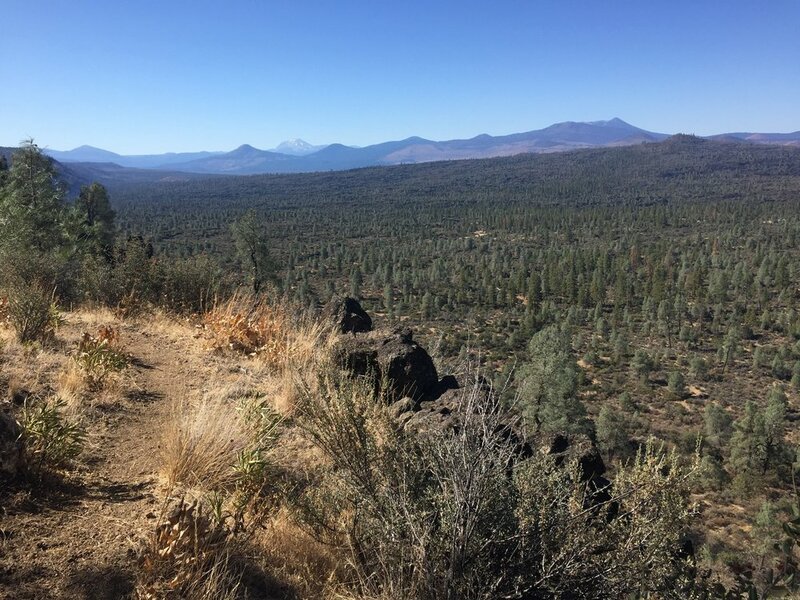 The trail followed a gradually ascending path for several miles over an old lava flow covered in an open forest of Gray pine, juniper, and several types of low brush. The day was still cool, though we had removed our extra layers, and we stopped frequently to comment on the beauty of this stark environment. The Gray pine is unlike most other pines, and this was the first time we had encountered them on our trip. This pine species grows as a native only in California, though their range within the state is fairly wide. Their gray-green needles, enormous cones, and multi-branched crown made a dramatic contrast to the gnarled juniper and dark lava. It seemed impossible that these cones the size and shape of a plump pineapple could come from these wispy trees, and yet we passed several young specimens with huge cones still attached. There was one final campsite under a juniper right before we started our climb up onto the rim, and as we passed we remarked that it looked as though somebody may have stayed there recently. Perhaps there was a SOBO or two not too far ahead of us. Macro is suspicious of these strange and tall thistles. Do you blame him? We were surprised to pass a NOBO thru-hiker on the climb up the sharp lava-encrusted wall of the Hat Creek Rim, but he passed without saying much so we didn't have a chance to ask him about the cache. 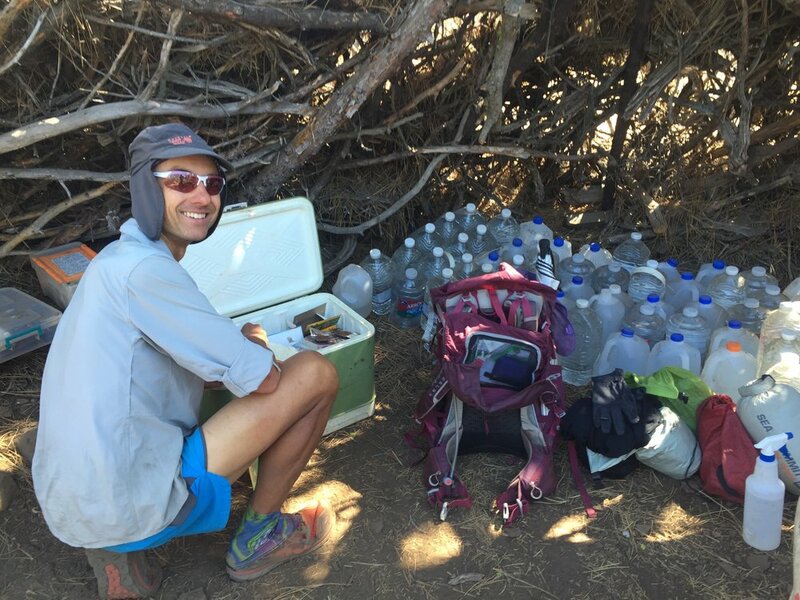 Although this is a ~30-mile waterless stretch of the PCT, a trail angel has historically maintained a large water cache near Forest Road 22 about halfway through. The NOBOs we camped with just outside of Seiad Valley insisted there was enough water at the cache to last for months, and a section hiker we met in the McCloud River watershed had reported the same, though he was flip flopping and it had been a few weeks since he went through. We know never to rely on caches as they are unpredictable. On the one hand, the number of NOBOs has been minimal recently so there shouldn't be too many hikers using water. On the other hand, maybe the trail angel is on vacation, or stops stocking the cache after Labor Day, or... It isn't worth risking 16 miles without water to depend on a source that might not be there when we arrive. The day was warm, but not blazing hot, and for that we were thankful. We found the Hat Creek Rim to be a spectacular stretch of trail as we meandered along the edge of a huge volcanic plateau covered in arid plants including groves of huge gnarled juniper, a rare Gray pine, plenty of blooming sage and rabbit brush, and the strange albino thistle with bright magenta flowers that we have seen in high desert environments. We had long views of the valley below with Mt. 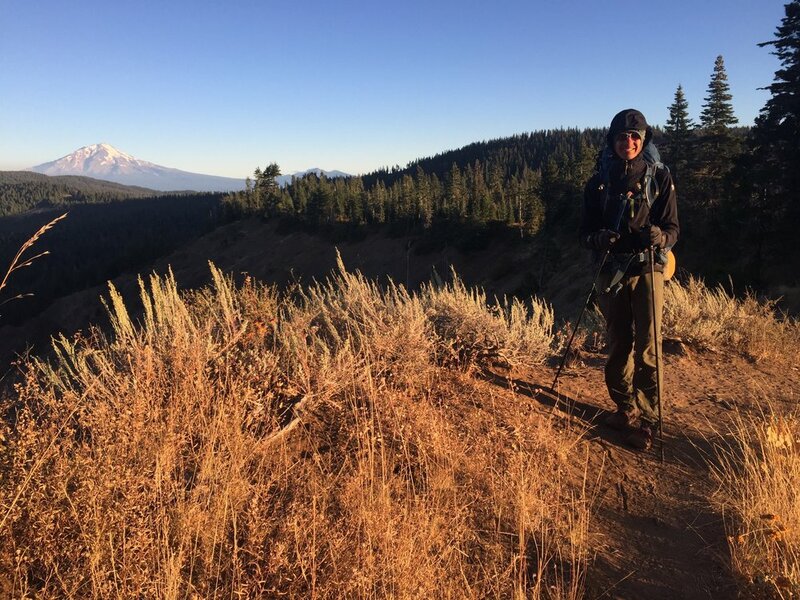 Lassen growing larger to the east and Mt. Shasta receding to the west. There was even a slight breeze to keep us cool. We didn't make great time in the 8 miles to Road 22 because we constantly stopped for the views or to take pictures, but with the easy terrain we were still there at a decent hour for lunch. We passed several campsites just before the road and guessed that the hiker we passed must have stayed here last night. We then looked around for the telltale signs of a water cache, and didn't find any. We went up the road past the abandoned horse corral, looked around several large trees, then went along the road in the other direction and even up the trail a bit across the road. I found one empty 2-gallon jug lodged in a shrub but no evidence of water anywhere. I have to admit we were both a little disappointed. We did have enough water to last us until the next source, but not having the cache to refill meant conserving all day and I had really hoped to have a long drink here and full tanks to continue through the afternoon. Macro pointed out that this is why we carried what we did, and we should just have our lunch in the shade of a tree. We enjoyed homemade hummus on Wasa crackers, and split a liter of electrolyte drink between us. Realizing we were already 16 miles into our 32 mile day boosted our energy as we hoisted our packs and headed across the road to wrap up this stretch of trail. We walked a few hundred feet up the hill before I saw several deck chairs sitting under a tree, noticed a makeshift shelter of limbs built around the trunk, and a small wooden sign saying "Cache 22." We just hadn't gone far enough up the trail! Inside the lean-to were at least a hundred gallons of water along with a chest full of snacks, spray bottles to mist yourself with water, and even some spare hiking necessities like ibuprofen, batteries, TP in case you needed a refill. This was trail magic at its finest. We had a seat and signed the log. We saw that a SOBO named Grateful Red had been through today, and wondered if he had camped just below the rim. Our friend Neemor was at the cache yesterday, and Beanstalk who we haven't seen since northern OR is still just 3 days ahead of us. We refilled our water bottles, enjoyed some granola bars, and left a small donation in the jar to express our appreciation for angel Devilfish who is responsible for this magic. Trailhead with shade. That's apparently worth a landmark on the Hat Creek Rim. It gets hot up there! The temperatures rose in the afternoon, so I was especially glad not to have to conserve my water. There were fewer trees on the southern half of the rim, and we were often further from the edge. I even used my Silver Shadow trekking umbrella for a few hours to provide shade without the heat of wearing a hat. Although the scenery wasn't quite as dramatic as it was at the edge, it was still a highly enjoyable stretch. We gradually descended in elevation and detoured around the deep canyon holding Lost Creek Spring, a water option that is not far off-trail in distance but requires a ~350' drop to the source and then a climb back to the trail carrying the water. We could hear the water gushing far below, and although it was comforting to know it was there in a pinch we were glad we didn't need it today. We had our second longish break at the campsites near the trail junction and enjoyed plenty of water from our packs courtesy of Cache 22. 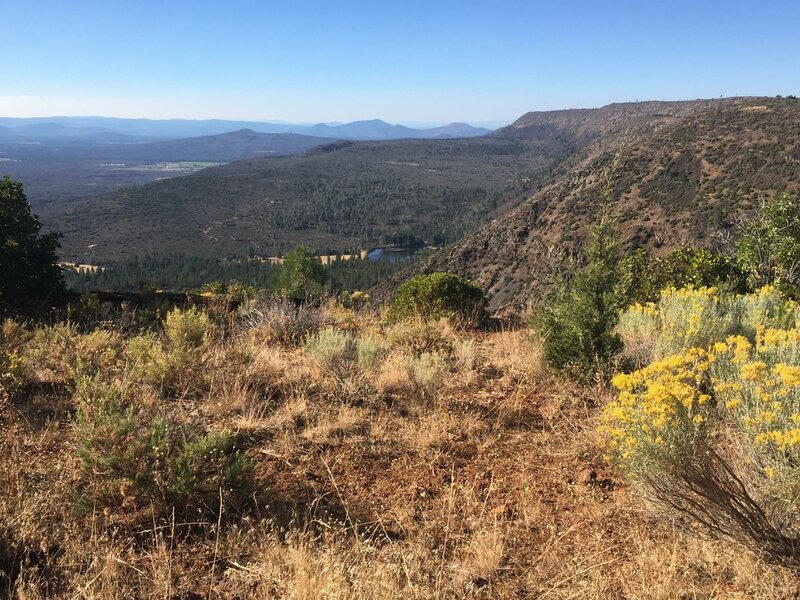 From there we passed several free-ranging cattle, went through a bunch of gates, crossed many nameless dirt roads, and went past the Hat Creek Rim Overlook marking the end of the plateau. The sun was getting low in the sky as we started our descent through the dusty, dry trail passing through a recent burn area. We were near the highway and it was a bit jarring to see and hear the truck traffic after a long day of seeing only a single person and no other sign of humanity. Golden hour light on Mt. Lassen accompanied our final few miles and the sun dropped below the ridge when we were about a mile out from our intended campsite near the junction to Subway Cave. The cave is another destination I frequented as a child, and have not visited in many years. Although we wouldn't be touring the cave, its parking lot just 0.4 miles from the PCT has a water spigot that is the first "on-trail" water since the creek near the fish hatchery early this morning. Macro set up the tent while I headed down the side trail to start dinner and water collection. It was dark by the time I reached the parking lot, though it was still warm on the concrete benches near the interpretive signs. The water spigot was in fact functioning, and in the empty parking lot under the stars and a setting sliver of a moon, I might just have taken a full-on hiker shower right there on the gravel. Nobody will ever know. We ate dinner by headlamp on the benches, then filled up with water and headed back to our campsite. It had gotten quite cold again, and we were happy to dive into our sleeping bags. We are just 2 days' walk from our next zero day at my parents' place just outside of Chester, and are looking forward to a little rest. We are also happy to be picking up our warmer clothes as the past 3 nights have been cold, a reminder that the season has changed. 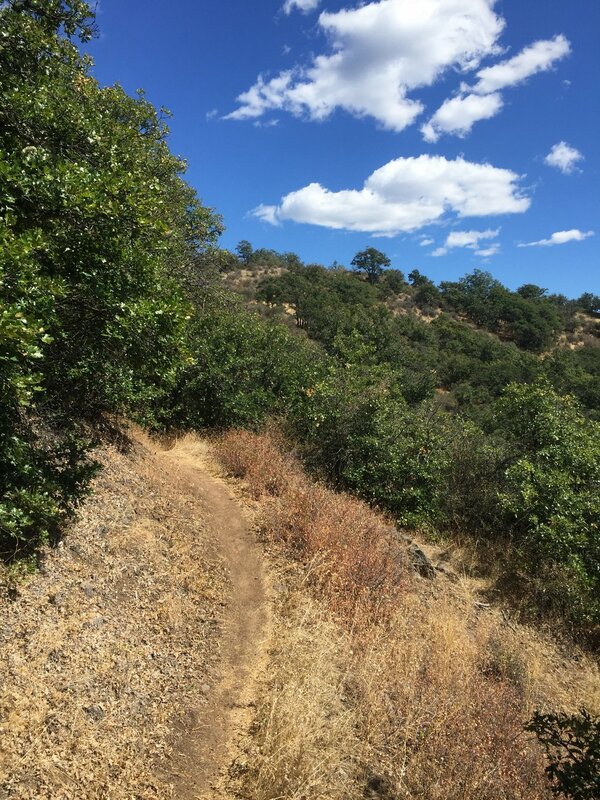 Though we are eager to reach the Sierra, we are enjoying the transition and are very glad we have not had to skip sections of trail due to fire, or flip-flop due to timing and fear of not making it through the higher elevations. One great beauty of this journey has been tracing a continuous path through adjacent ecosystems, and we are very hopeful that conditions allow us to continue our route unbroken all the way to the southern border.